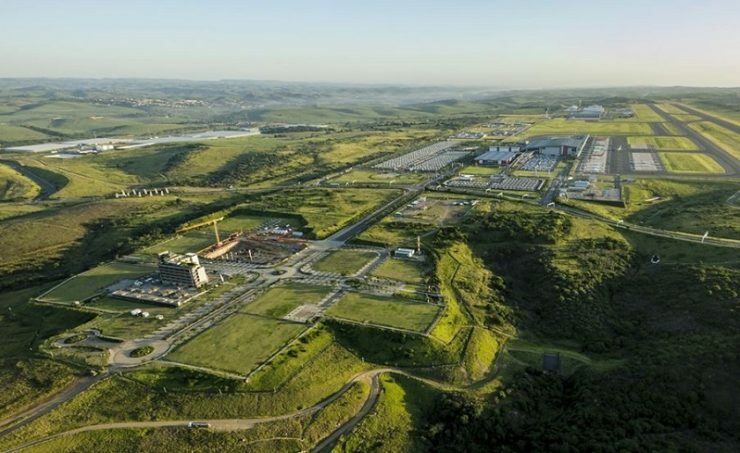 According to *Constructionreviewonline news report, South Africa’s Dube Trade Port Special Economic Zone (DTP SEZ) in Kwazulu province is set to undergo expansion at a cost of US $1.2bn. MEC for Economic Development, Tourism and Environmental Affairs, Mr Sihle Zikalala unveiled the reports. “If the massive success of the first phase of the DTP SEZ which we launched in 2010 is anything to go by, we are doubtless that the second phase which we are launching will surpass all expectations,” said Mr Sihle Zikalala. The Dube Trade Port which is one of the two SEZs in the province, has already created thousands of jobs and contributed immensely to the provincial fiscus since opening its doors. This has led to continuous experience an unprecedented wave of investments in the province. The first phase of the project included a signed lease agreement from the Mara Group, which is ongoing with its plans to invest US $104m into Africa’s first fully-fledged smartphone factory. Mr Zikalala described phase 1 of the project as a resounding success since to date it has created over 12,000 job opportunities for residents and further attracted US $222m in private sector investment. Phase two of the of the project is estimated to bring an 45 hectares of prime light industrial land within the Dube TradePort Special Economic Zone. It will offer more opportunities in different sectors such as aeronautical services, aircraft repair, electronics, aircraft maintenance, executive aerospace, overhaul and fixed-base operations among others. The mega development in return is expected to generate US $1.4bn within the SEZ over the next five years. “We are looking forward to increased business activities worth more than US $13.9bn with this upcoming expansion of the zones and unleash considerable job opportunities for residents,” said Mr Zikalala. On his side Dube TradePort CEO Hamish Erskine many companies have already shown interest in occupying sites in the Phase 2 development, showing how the project is crucial to the economy at large. President Cyril Ramaphosa and national ministers will officially unveil the cell phone manufacturing plant once complete. “We are confident that we will be in a position to make some major announcements in this regard soon,” said CEO, Hamish Erskine.